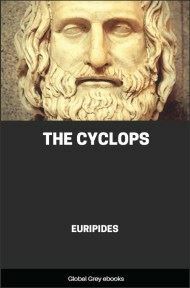 The Cyclops is an Ancient Greek satyr play by Euripides, the only complete satyr play that has survived. 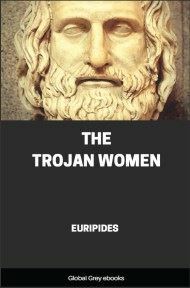 It is a comical burlesque-like play on a story that occurs in book nine of Homer's Odyssey. Odysseus has lost his way on the voyage home from the Trojan War. He and his hungry crew make a stop in Sicily at Mount Aetna, which is inhabited by Cyclopes. They come upon the Satyrs and their father Silenus, who have been separated from their god Dionysus and enslaved by a Cyclops. Silenus: O BROMIUS, unnumbered are the toils I bear because of thee, no less now than when I was young and hale; first, when thou wert driven mad by Hera and didst leave the mountain nymphs, thy nurses; next, when in battle with earth-born spearmen I stood beside thee on the right as squire, and slew Enceladus, smiting him full in the middle of his targe with my spear. Come, though, let me see; must I confess ’twas all a dream? No, by Zeus! since I really showed his spoils to the Bacchic god. And now am I enduring to the full a toil still worse than those. For when Hera sent forth a race of Tyrrhene pirates against thee, that thou mightest be smuggled far away, I, as soon as the news reached me, sailed in quest of thee with my children; and, taking the helm myself, I stood on the end of the stern and steered our trim craft; and my sons, sitting at the oars, made the grey billows froth and foam as they sought thee, my liege. 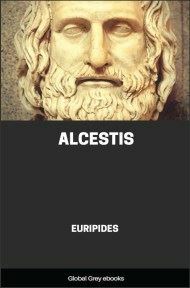 But just as we had come nigh Malea in our course, an east wind blew upon the ship and drove us hither to the rock of Aetna, where in lonely caverns dwell the one-eyed children of ocean’s god, the murdering Cyclopes. Captured by one of them we are slaves in his house; Polyphemus they call him whom we serve; and instead of Bacchic revelry we are herding a godless Cyclops’s flocks; and so it is my children, striplings as they are, tend the young thereof on the edge of the downs; while my appointed task is to stay here and fill the troughs and sweep out the cave, or wait upon the ungodly Cyclops at his impious feasts. His orders now compel obedience; I have to scrape out his house with the rake you see, so as to receive the Cyclops, my absent master, and his sheep in clean caverns. But already I see my children driving their browsing flocks towards me. What means this? 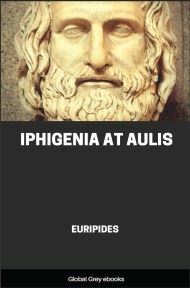 is the beat of feet in the Sicinnis dance the same to you now as when ye attended the Bacchic god in his revelries and made your way with dainty steps to the music of lyres to the halls of Althaea? Chorus: (singing) Offspring of well-bred sires and dams, pray whither wilt thou be gone from me to the rocks? Hast thou not here a gentle breeze, and grass to browse, and water from the eddying stream set near the cave in troughs? and are not thy young ones bleating for thee? Pst! pst! wilt thou not browse here, here on the dewy slope? Ho! ho ere long will I cast a stone at thee. Away, away! O horned one, to the fold-keeper of the Cyclops, the country-ranging shepherd. Loosen thy bursting udder; welcome to thy teats the kids, whom thou leavest in the lambkins’ pens. Those little bleating kids, asleep the livelong day, miss thee; wilt then leave at last the rich grass pastures on the peaks of Aetna and enter the fold? . . . Here we have no Bromian god; no dances here, or Bacchantes thyrsus-bearing; no roll of drums, or drops of sparkling wine by gurgling founts; nor is it now with Nymphs in Nysa I sing a song of Bacchus, Bacchus! to the queen of love, in quest of whom I once sped on with Bacchantes, white of foot. Dear friend, dear Bacchic god, whither art roaming alone, waving thy auburn locks, while I, thy minister, do service to the one-eyed Cyclops, a slave and wanderer I, clad in this wretched goat-skin dress, severed from thy love? Silenus: Hush, children! and bid our servants fold the flocks in the rock-roofed cavern. Leader of the chorus: (to Servants) Away! (To SILENUS) But prithee, why such haste, father? Silenus: I see the hull of a ship from Hellas at the shore, and men, that wield the oar, on their way to this cave with some chieftain. About their necks they carry empty vessels and pitchers for water; they are in want of food. Luckless strangers! who can they be? They know not what manner of man our master Polyphemus is, to have set foot here in his cheerless abode and come to the jaws of the cannibal Cyclops in an evil hour. But hold ye your peace, that we may inquire whence they come to the peak of Sicilian Aetna. Odysseus: Pray tell us, sirs, of some river-spring whence we might draw a draught to slake our thirst, or of someone willing to sell victuals to mariners in need. Silenus: All hail, sir! tell me who thou art, and name thy country. 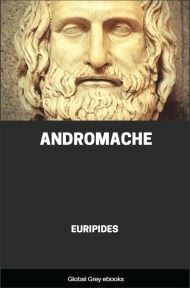 Odysseus: Odysseus of Ithaca, king of the Cephallenians’ land. Silenus: I know him for a prating knave, one of Sisyphus’ shrewd offspring. 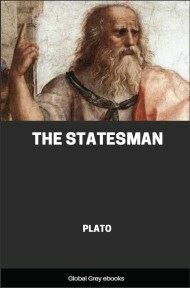 Odysseus: I am the man; abuse me not.